SOS! Yangtze finless porpoise appeal for international help! 12 died within 44 days. 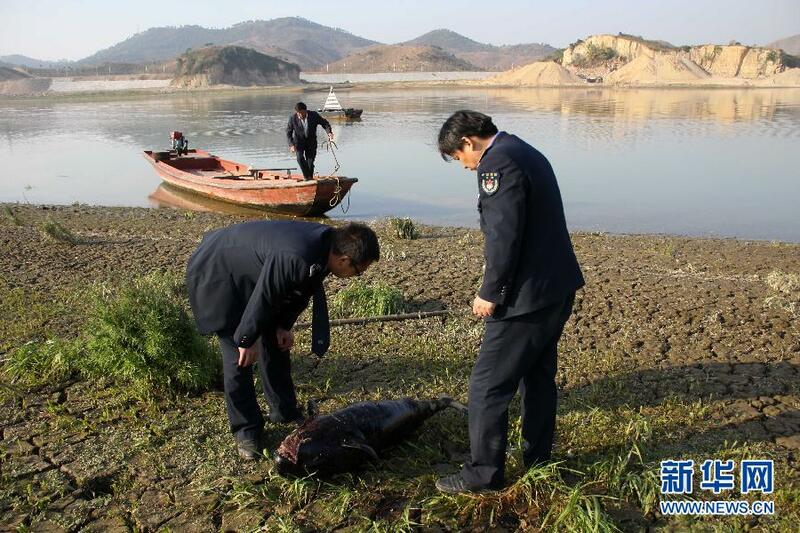 Until 15th April, in a week, over 9 Yangtze finless porpoise have been found dead in Dongting Lake, the second largest freshwater lake in China. 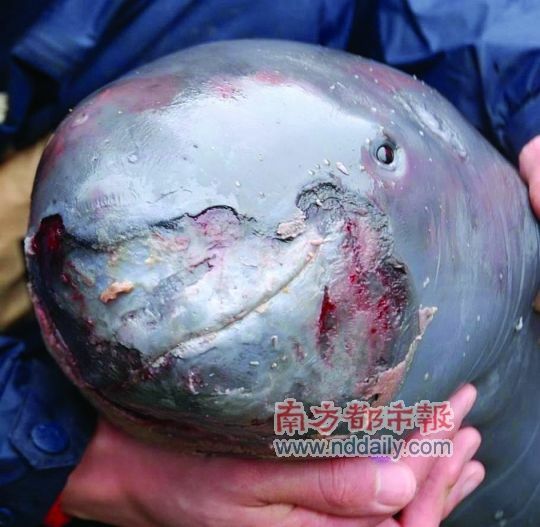 Totally, there are 12 Yangtze finless porpoise died from 3rd March. From early this year’s statistic, there are only 120 finless porpoise left in Dongting Lake, and only about 1000 in total in Yangtze River. 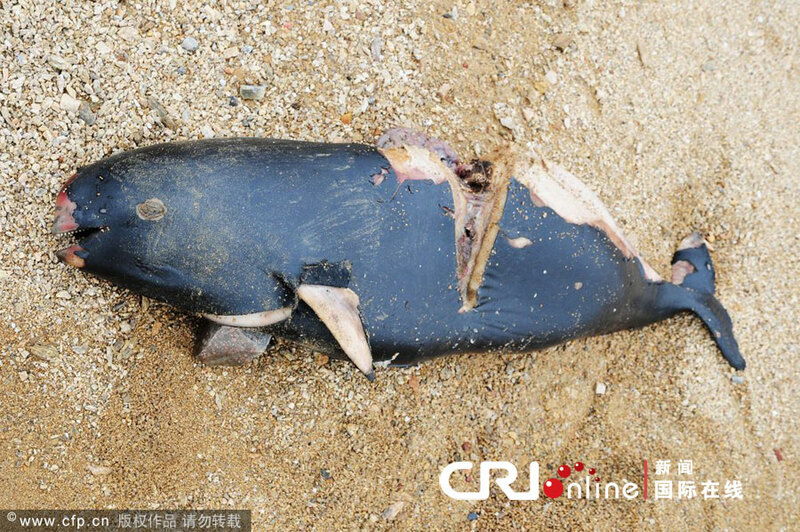 Not only in Dongting Lake, Poyang Lake, the largest freshwater lake in China also find several death of Yangtze finless porpoise. Among the 12 dead porpoise, one of the porpoise was pregnant for about nine months. The hit cut in its head shows that she may also die from propeller hit. Another porpoise had a fish in his month that he was just about to swallow when found dead. April 19th, the anatomy results from the Institute of Hydrobiology, CAS shows that the one with fish in its mouth is died from electro-fishing and the other whose head has been cut by half was died from propeller strike. What is electro-fishing? A paragraph from Dr. Sam Turvey can tell us. Dr. Sam Turvey is Royal Society University Research Fellowship, Institute of Zoology. 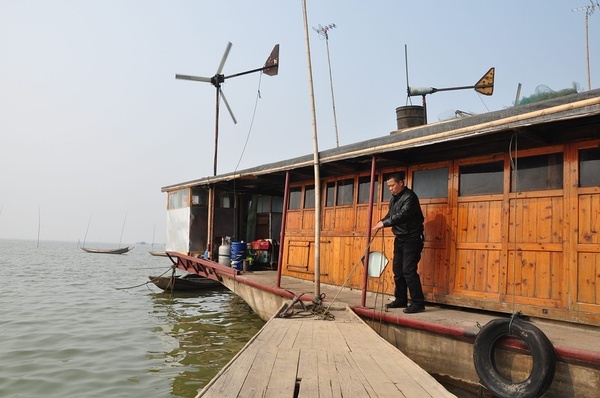 And he was one of the experts participated in the 2006 Yangtze Baiji investigation organized by Institute of Hydrobiology, CAS and supported by WWF. 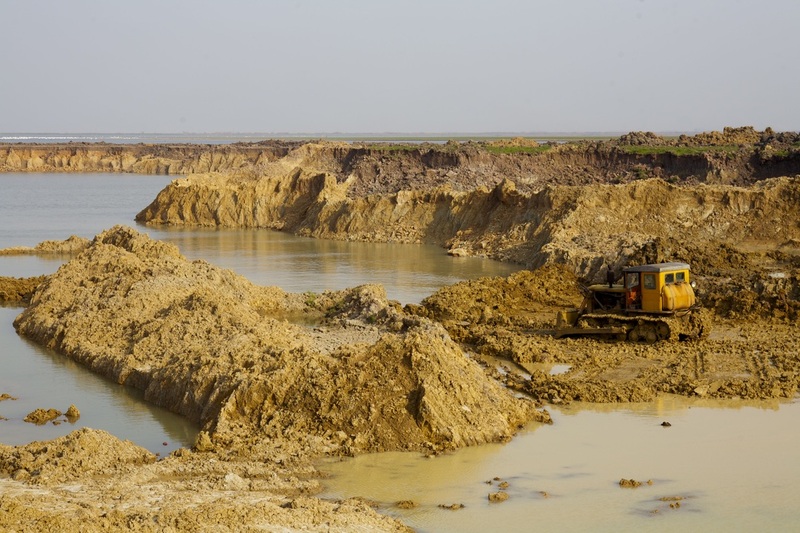 It was that time that scientist announced the function extinct of Baiji, the only freshwater dolphin in Yangtze and the first mammal extinct because of human activity. This news was widespread broadcasted by chinese news media and got short time attention in the society. However, there were no official response from government. Soon, this news submerged into everyday vigorous economy development and pollution emissions, only left some environmentalist and environmental victims suffering from helpless heart broken and weak appealing like a headless chicken. 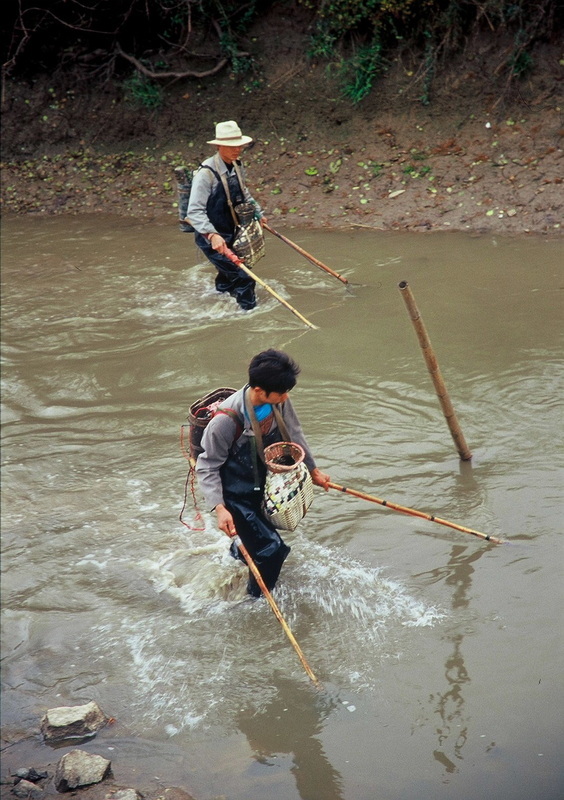 There are not only big gangs of electro-fishing, individual fisherman also use this method to catch fish. They will first use pump to lower the water level and chase fishes into smaller area; then put electric charges into the river; finally collect the floated big fishes to ship to the market and left the others on the ground. This kind of fishing gives the Lake a catastrophe and is like kill the goose that lay the golden egg. Some of the porpoise died directly from the electric shock, others are fainted by the shock. Porpoise is a mammal and need to float to the water surface to breath every few minutes. If the fainted one does not recover within few minutes, it would die from drowning. The Yangtze Finless Porpoise is the only freshwater sub-species of the whole Porpoise family. In Dongting Lake, local residents usually call it as “JiangZhu”, “Zhu” in Chinese means piggy, an animal represents lucky, prosperous and mischievous to chinese people. 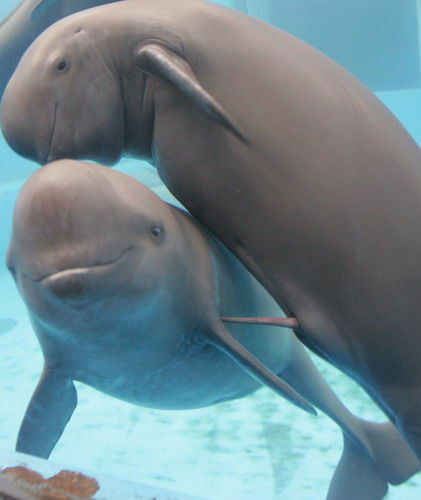 Yangtze Finless Porpoise has a nature smile on their face and they are one of the most intelligent creatures on earth, with a level of intelligence comparable to that of a gorilla. And they are very friendly to human beings. 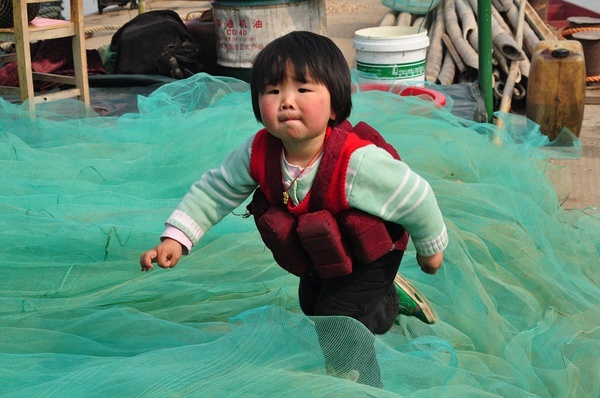 Senior fisherman tells their offsprings that “Jiangzhu” is their beloved playmates when they were young. This shy creature love to play with the spray behind the fish boat. their sound is like whistle. Usually, everyday when fisherman paddled out for fishing, two or three porpoises would follow their boat and play happily. When there are big storm coming, porpoise would all dance in the water surface to remind the fisherman. But these scene is becoming an legend. This famous picture, the dolphin’s tear, was took at last year May 20th when the middle and lower Yangtze was suffering from the serious drought. The water level in the Tian Ezhou Yangtze Dolphin Nature Reserve, the only captivity for Yangtze Finless Porpoise in China, was less than 3 meters and some location even less than 2 meters at that time which greatly threatened the survival of the porpoises that has been kept there. 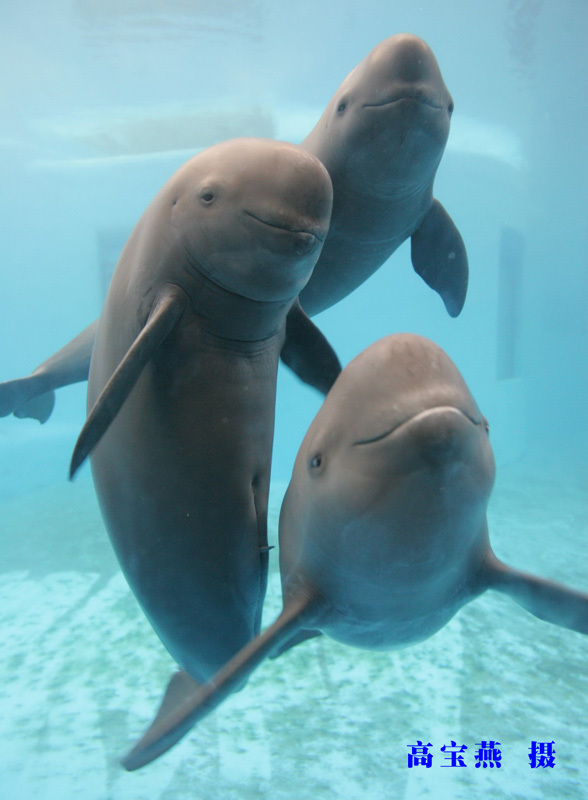 In the picture, staffs from Institute of Hydrobiology, Chinese Academy of Sciences and Tian Ezhou Yangtze Dolphin Nature Reserve is helping neaped Yangtze Finless Porpoise to relocate. The “tear” of this porpoise is not really the tear but a kind of lucid secretion. When porpoise get stimulation, they would secrete some kind of grume. Said by Ding Wang, the fresh water dolphin experts in the Institute of Hydrobiology, China Academy of Science. “although it is not tear, but this kind of grume is a reaction of the anxious in the body.” “ We are also anxious about their destiny.” This tear dolphin finally died. WWF organized wetland ambassador action among universities in China during the past 10 years. In 2011, the topic is Yangtze Finless Porpoise. the girl in the picture is a student from that action, when she visited the Institute of Hydrobiology, CAS and saw this dead porpoise, she can not help but cried inconsolably. 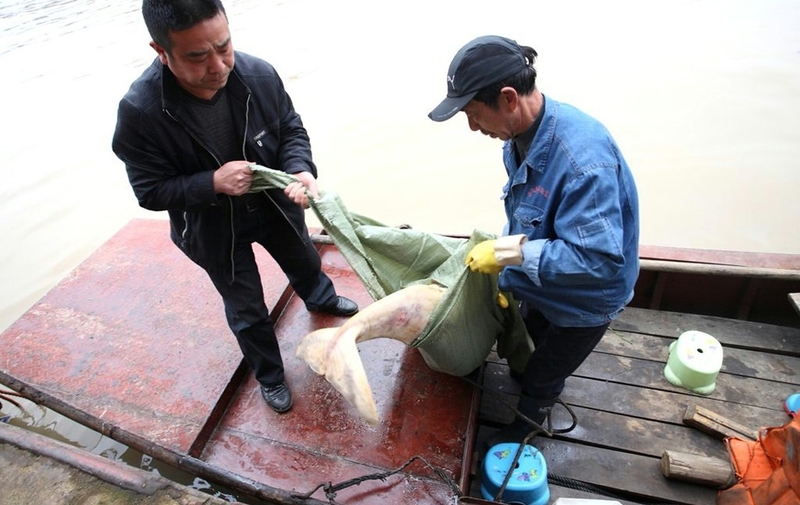 Ten years ago, there were still 1200 Yangtze Finless Porpoise in Dongting Lake; in 2008, this number shrank to 200; in 2009, an investigation organized by WWF and the Institute of Hydrobiology, CAS shows only less than 150; March 2012 85; From 3rd March to 15th April, 12 died!! What’s the next step? 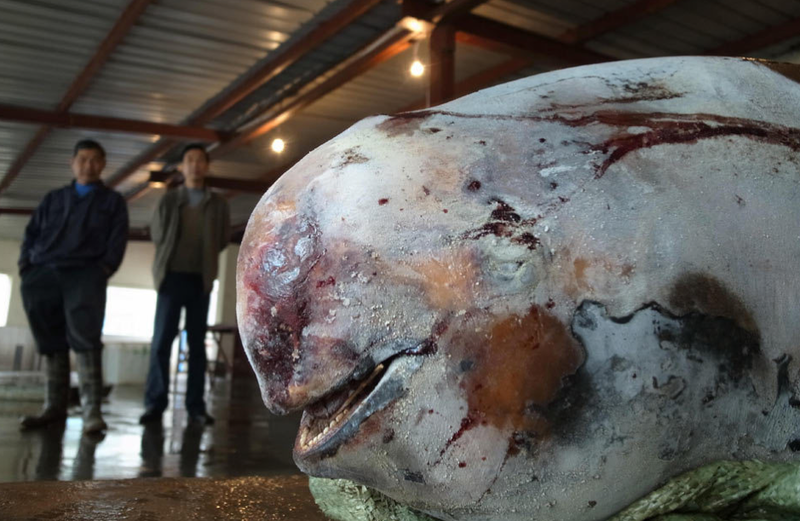 Experts estimated that, if there is no action, the 73 Yangtze Finless Porpoise may died out within few years. However, there is an embarrassed situation, no government department want to take the responsibility for that. Beautiful sunset cast a brush of golden color in West Dongting Lake. Fisherman are paddling the fish boats peacefully in the lake. However, if you look closely, there exists the “asian biggest fish net” called by the local fisherman. It also has another name: THE EIGHT DIAGRAMS trap, means once enter, can never get out until be caught and killed. Fisherman use this method to catch fish. The heigh of the fish net ranges from three to twelve meters, the length of it marches hundreds to ten thousands miles. Every year, when winter come, after the water level lowing and some lakebanks expose, local fisherman will starts inserts these kinds of net. The arrangement of the net is like a eight diagram trap, once enter, all the water creatures can only swim in but cannot get out. And usually the entrance is just like the normal water surface that fishes can never tell. Fisherman are sewing fish net, the net whole is so small that even ant cannot pass through.lots of fisherman choose to live on the boat and their kids also grow up on the boat with lifebelt on them all day long. Some of those fisherman are belong to the lowest income family but they are also one of the biggest killer to the local environment. Those fishing nets divided the whole lake into a messy chessboards, greatly threatened the fish resources and the lake eco-system. sometimes Yangtze Finless Porpoise will also be trapped into those nets. Because every few minutes, the porpoise has to come to the water surface for oxygen, the trapped one usually died because of drowning. Although the Hunan government closed 234 paper mills around Dongting in 2006. 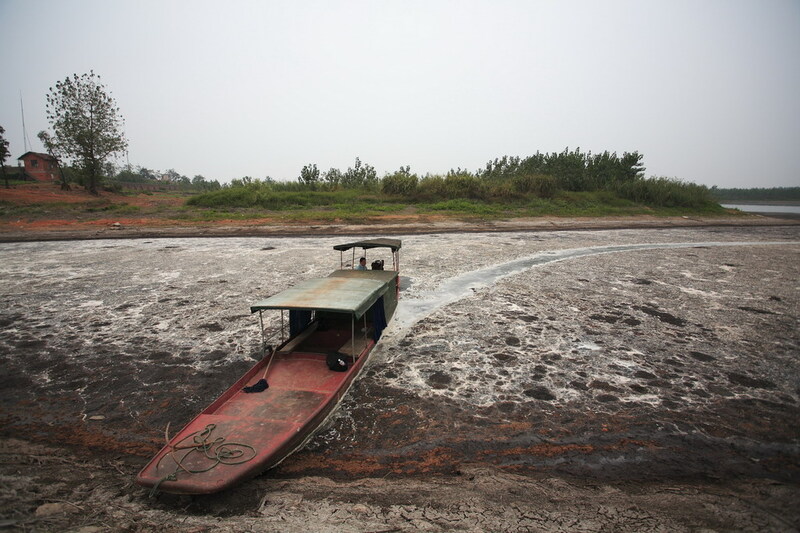 There are still tons of thousands of chemical factories around Dongting Lake. 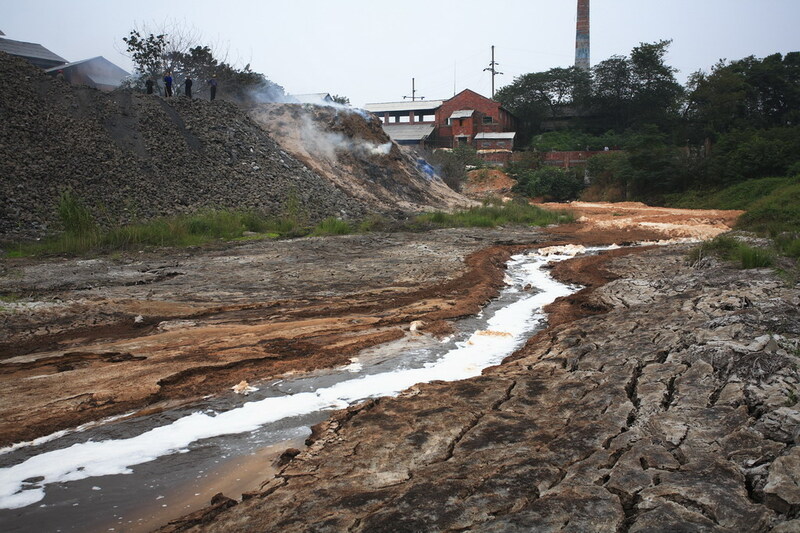 those factories usually discharge untreated polluted waste water into the lake, make the lake a big poison spot. One of the dead porpoise is suspected died from poison. In winter, those sand dredging companies will use truck to dredge sand from the exposure lakebank. Other times, they use big dredging ship. As the picture shows, there are dredging ship everywhere in Dongting Lake, the porpoise usually have to swim among these giant monster. Not carefully, they would killed by the dredging hand. Pinless porpoise have to use sonar system to find their way. The noise of the ship keep on disturbing their sense of direction. Some of them will hit by the ship because of the disturbance.